With great value all inclusive, brilliant beachside locations and hotels with entrance to attractions included, you’ll all enjoy your family holidays with us. 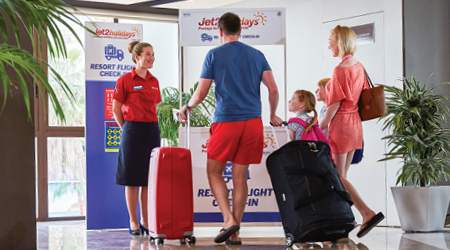 Plus, our free pushchair carriage and family-friendly flight times make things even easier too. Family holidays are all about fun, and there'll be smiles all round when treats like ice creams and exciting activities are all included in the price. Holidays with waterparks and theme parks included are even better value with our Free Child Places. Our Family Favourites hotels all have children’s pools, entertainment and hotel-run kids’ clubs. Check out our range of hotels with fantastic facilities for babies and toddlers. Great deals for Easter, May and October Half Term and the Summer Holidays. Travelling with a larger brood and need more space? We offer great family-sized rooms. Our group holidays are great for larger families or even multiple families having a holiday together. You won’t get any moans and groans from the kids at one of these hotels! We’ve rounded up our properties that offer on-site Aqua Parks as well as pools. Fantastic family holidays with entrance to waterparks and attractions included. You can relax and enjoy the sun, knowing the kids are having a great time in the pool and Splash Park. With these well-equipped hotels, children are guaranteed fabulous fun. From family-focused campsites to luxury glamping, you can take your pick from our selection of perfect parks. Great for groups, our large villas offer all the space you need to have an incredible holiday. We’ll make going home much easier!